Jan Nemecek is one in a long line of musical outriders venturing into the long night of space. 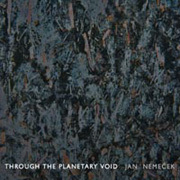 Through the Planetary Void (56'00") is his extended meditation on the vastness of the cosmos. With an elegant simplicity, Nemecek attempts to reprogram the listener's brain to accommodate the enigmatic themes and profound scale of this work. Using resonant synthesized tones, a captivating cycle of chords, a contemplative pace and well-crafted effects, Through the Planetary Void possesses the classic character of this genre's time-honored greats. From atonal iron drones and sparkling modulation accents to warm pads underpinning a shimmering electronic atmosphere, this album presents an imaginative range and perfectly arranged array of sonic elements - within which the listener may project their own dreams. While subjects often become simplified in the process of study, the work of this artist only deepens the mystery.